Tweet If you happen to run into a talk show starring comedienne Jessica Kirson, it’s because her show, produced by “Scrubs” star Zach Braff, takes place in the middle of nowhere. Although currently it is in the pitching stage, it may just end up in a ‘nowhere’ near you. She recently stopped by to talk about her life in stand-up. Q – There seems to be a lot of female comedians today. Years ago, there were only a few. What was so attractive about stand-up comedy? A - I think women feel more comfortable being honest and upfront on stage. There is nothing more powerful for me, as a woman, than to stand on stage and make people laugh. Years ago it was unheard of for a woman to act silly and take a stand. Q When did you first start doing stand-up? A - I started 11 years ago. I took a comedy class in New York. Q – Do you think women comics have a harder road to success than their male counterparts? A - Yes I do, of course... I mean if you look at all of the headliner clubs around the country there are maybe 10 female headliners. There are hundreds of men. When I headline on the road, it is never me and another female comic. There are always two male openers. Q – Every time I go to YouTube or turn on cable, there is a comedian on. Do you think with all the outlets for stand-up comics, there is an oversaturation of comedians that make it harder to get noticed? A - Well there are definitely a ton of comics. Youtube is really the way to go. I don't think it's harder to get noticed. I think that it makes it much harder to get work. 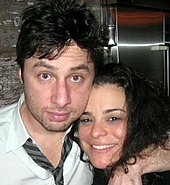 Q – Tell me about “The Jessy K Show.” That was a reality show produced by Zach Braff. How did this come about? How did Braff get involved? A – “The Jessy K Show” is a reality talk show. Basically we just plop it down in the middle of nowhere. We have a live band, an audience, and guests. It is a blast. Zach is actually my step-brother and we have been wanting to do something together for a while. Q – This was just a pilot. Did it get picked up? A - We are pitching it now. Q – You’ve done a bunch of TV spots. Do you think the notoriety from your TV spots is better than working clubs? A - Absolutely, doing TV is the best way to get noticed. Q – A lot of comedians end up on television in some fashion. Is this the ultimate goal for comedians? A – Yes, every comedian I know wants to be on TV in some fashion. A - I have a YouTube channel: www.youtube.com/thejessykshow. It is a blast for me. I am touring a lot. I am also a regular on “The Joy Behar Show” on CNN. For more information on Jessica, visit her website at: http://jessicakirson.com.